I got back from Canada yesterday and have photos to share in my next post. 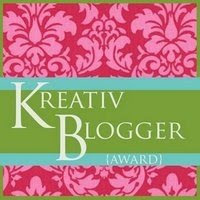 While I was gone, Faye and Becky each bestowed upon me the Kreativ Blogger Award! What an honor. I have so much respect for both of you and your sewing prowess. 2. Link to the person who awarded it to you. 4. Link to those 7 on your blog. 5. Leave a notification message for your 7 nominated bloggers. Congrats Babe!! I know you're the most 'Kreativ' sewer I know!! Congratulations! And thanks for the links... oooh, new sewing blogs to read. Congrats! & thank you so much for passing the award on to me--I'm super flattered given your own sewing skills.